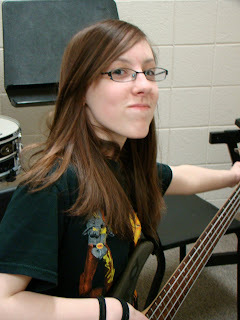 I was at a band concert last night (another one!) (I'm trying to resist the urge to post pictures) (help me) and as I was leaving the building after I left (I had to leave early because I was dead tired and a little sick) (don't worry, I didn't miss Hayley's big part--a duet feature with a flute player during the song "Into the Storm") I caught of whiff of something non-native to this area. I can't quite describe it, but it had something to do with redwood trees and beaches and landscaped yards with sculptured bushes and piers and close personal friendship with the sun and mountains and fog and more sun. I smelled California in the air way out/up here in Minnesota. Seriously, how many of these am I going to post about? Well, all of them. Because I have nothing else to post about. The lilacs are not in bloom yet, so I can't post about that. Matt didn't say anything funny because he's too busy asking me if he can play Angry Birds. And Hayley's tooth Evelyn is just sitting in her mouth. So we're back to band concerts. You might have to click on this picture to see detail. Seriously, does Paul ever play? 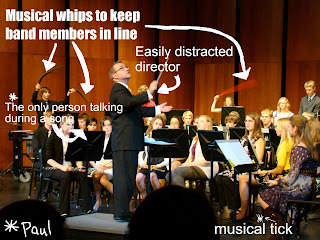 He doesn't talk at home, yet he can't stop yakking during his own band concert. And the reason Mr. K is looking over his shoulder is to signal to the person who was singing (she was way up high in the lighting booth) to get ready to sing again. And the "whips" make really cool sounds. I'd post the video I took, but it's 10 minutes long and even then, it cut out before the song actually ended. That's right folks, the one song lasted 15 minutes. In two weeks Paul is going to Prom! Not at our local high school; he's going to the school a district or two over to the east. I was resigned to a Prom-picture-less spring because Paul said he wasn't going. But then a friend convinced him to ask someone. He dyed the egg himself on Easter Sunday morning, then texted a picture of it to the girl. I had to get pictures myself, of course. Isn't it cute? Friends I've told thought it was very creative. I love that the girl replied with Peeps! I AM SO DANG BUSY TODAY. So you will have to wait until tomorrow to read about Paul's upcoming prom date with accompanying picture (or two). Now I have to prepare for an activity at work tomorrow. It involves chopping up red cabbage and boiling it. No, it's not a half-sized ten things list; it's a piece of advice I gave out recently. A certain person confided to me that he/she had a messy car. In fact, the trunk, she/he said, contained a relic from 4 years ago, namely a hot chocolate covered mug that probably still had remnants of the hot chocolate in it. And it was buried under years of detritus. I told this person that every time he/she got out of the car, no matter where she/he was, he/she should grab five things from the car (not including things she/he was transporting from place to another such as DVDs to return and groceries). It really is a GOOD Friday! I don't have to work! It's a very rare day when school is closed AND my work is closed too. Usually I have to work a full day on no-school days. Even more GOOD, Jim is off work! His department relies on the stock market, which is CLOSED! So we have Jim home, the kids home, and me home! In sporting news, Paul had a track meet yesterday, which I was unable to go to (because it was in Stillwater and I was in Prior Lake working). 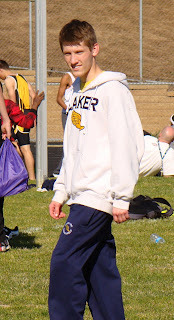 He ran both the 1600 and the 3200 (first time this season). He did ok in the 1600, but got a personal best in the 3200: 10:37! He says the coach is now going to put him in the 3200 more often. He's still the top guy in the 1600 too. Yay for Paul! I have no pictures of the race (having not attended) and usually I would just "borrow" some from the woman who goes to all the meets and takes many metric tonnes of pictures, but she hasn't put them out yet. ...is that I worry that the one daffodil that is this >< close to blooming will die because of the snow. Luckily there will be more daffodils. Today is a ten things day because I feel like posting but nothing is going on (except the rapid dispersal of frozen precipitation from the clouds above). 1. Despite the snow, the lilac bushes have started to leaf out. The weather will set them back a week or so, but that's ok. It's like stretching Christmas out an extra couple of days. I love the anticipation of flowers! I check my plants every day! 2. I'm hungry even though I ate two breakfasts. Obviously they were crappy breakfasts if they didn't fill me up. Anyone have any ideas for fast, easy, nutritious breakfasts that fill you up? 3. We're gonna play Jeopardy in seminary tomorrow. The pacing guide for seminary lessons says to teach a THIRD lesson on Brigham Young, but I'm all Brigham'd out. Chapter 247 in a future book called "The Embarrassed Organist"
Possible subtitle "How to really screw up on the organ and still be asked to play"
I was asked to sub for the regular organist yesterday (well in advance. I couldn't rely on the "not enough time to practice" excuse). It was ward conference, so the head honchos were in town too. And I totally messed up the first song. It was a song I can't play very well (219 Because I Have Been Given Much--Katie, I SO needed your skillz with that song yesterday) so I decided to take advantage of the autoplay on the organ, i.e. the organ was going to play itself. How could I screw up a song the organ was going to play by itself, you ask? Oh, I found a way. I KNEW if I posted a complaint about my skirt that I would find it. I found it in a laundry basket. The strange thing is that I've LOOKED IN THAT BASKET NEARLY EVERY DAY SINCE I LOST THE SKIRT. I SWEAR I looked in that basket for the skirt. I also looked in the basket for socks, shirts and exercise pants. I SWEAR it was not in that basket. I'm thinking that the skirt needed a break from being worn 3 times a week to seminary and it went invisible for a bit to get away from me. Or it's a ninja skirt and had to attend to a few assassinations and only recently returned. I should be glad I wasn't one of the targets. The only other explanation would be aliens. An alien race of black skirt like creatures thought that my skirt was one of their lost ones. It took them long enough to realize it was just a plain black skirt. I cannot find my favorite black skirt! I put it in the laundry and it disappeared! I cannot find my low heeled black strappy shoes! I lost my black slip, but Hayley found it in a pile of her clean clothes. My theory is that the washing machine and the dryer have magical abilities and very slight mischievous streaks. I'm not just going on evidence of a missing skirt and a misfiled slip (I don't think the machines had anything to do with the disappearance of the shoes--that can only be explained by poltergeists), but on the unexplained appearance of a pair of socks (?) made out of floral polar fleece (seriously, they are kinda weird looking) and another pair of pink and white socks. Hayley swears these foot coverings are not hers and nor do they belong to the only female sleepover participant (Hayley's friend Gabby) we have had this year. A long time ago in the land of flickr, I posted a picture of a ladybug cake I made for a scout fundraiser. A few days ago, I received a request from someone who was searching on flickr for birthday cake ideas for her website focusing on children's parties, and she wanted to share my ladybug cake! I said yes and shared some tips for making it. To see my ladybug cake featured on the party website, go here. Scroll down. It's the second cake. Spring is here! And along with warmer temperatures, green grass, and daffodils, we have track meets to go to! Guess who is happy about the track meets? Here he is at the starting line. This is from the second lap. And at the finish line!He came in 8th (of 28) with a time of 4:54. Way to run Paulie! As I was editing pictures, Jim leaned over my shoulder and asked, "Did you ever think little Bucket Head would grow up to be a good runner?" Bucket Head. I haven't thought of that particular nickname for Paulie in a long time. A very long time ago (oh, maybe 14 or 15 years) our tow-headed toddler found a Halloween bucket and put it on his head. He wore it for days. For the last few months, I've seen a fabric lump around the house. The fact that I never did anything with it (like toss it out) doesn't speak well of my housekeeping philosophy or routine (if I even have one). Finally a few weeks ago, I happened to notice Matt fiddling with it. I asked him if the fabric lump was his. 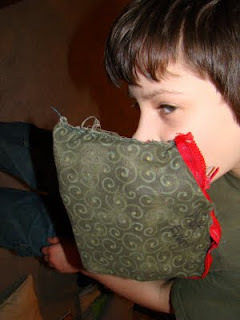 He said, "I lost the pencil bag you got me at the beginning of the school year so I made this one to replace it." It's a pencil bag? No wonder it was lumpy. I asked to examine it. Last night I was on the phone with Katie. She kept bugging me to take a picture of Evelyn (remember Hayley's tooth?). Just thinking about exposed unerupted teeth and pulling gums back like banana peels made my flesh crawl (and my gums cringe and hug tighter to their neighboring teeth). K: I wanna see the tooth! Me: Too bad. I can't take the picture. Me: No. You'd be grossed out and then you'd say, "I shouldn't have looked at that!" K: But I have to SEE it to be able to SAY "I shouldn't have looked at that!" Me: Why even look? You don't want to see it. K: That's why I want to see it. Mouth surgery. I like to say it this way because it makes the procedure sound much more intense than it really was. The oral surgeon cut open gum tissue above tooth #11 (which has stubbornly refused to come out to play with Hayley's other teeth), exposing it so that the orthodontist will be able to attach machinery that will pull #11 (aka Evelyn) down and force it to join the other teeth as an operable member of Hayley's permanent dentition. April Fool's Day. It's not usually celebrated around here (except on my blog. Yeah, no tattoo for me). However, I thought it would be fun to do dinner different tonight in honor of the day of pranks. I printed up a menu of items (food, utensils, drinks, plates, etc) in different languages. Here is the table I set for the kids. 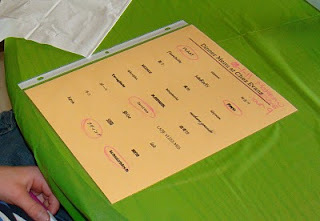 All they got to start with was the menu and a marker to circle which items they wanted to order. They got to order 5 things at a time. Paul knew what "huevo" was, but not "cuchara grande." According to babelfish dot com, cuchara grande means big spoon. So he had something to eat his gravy with. He got a plate, a fork too. Matt wasn't so lucky. He got food, but no utensils. He was indignant about the carrots, but he was happy about getting pudding. And a dishtowel bib. He had to eat his carrots using his bib because he hadn't ordered a fork. I haven't done a ten things list in a while. And since I can't think of anything else to blog about (and I'm not making any freezer casseroles today so I can't blog about that) I'll resort to my cop-out blog formula. The blog almost writes itself! So you get a to-do for to-day. 1. Now that Jim has an iPod (as do the rest of us), I think I can safely throw out all the CDs. They are such wasters of space. Time to clean out the stereo cabinet, the CD racks, the four boxes in his closet. Might as well get rid of his vinyl collection too. He NEVER plays his records. 2. Decal the van. I have several bumper stickers lying around that I haven't put on the vehicle yet. Jim gave me a couple of bullet hole stickers too as a joke. Might as well slap them on too. 3. Organize my shoes by height to soothe the headache I get from disorganized visual stimuli every time I look in my closet.